Got the third book this morning. I can't wait to read!! No I haven't read the series yet but that's why I'm entering the giveaway :D The books have always interested me but I never have the chance to read them @ the library, so praying I'll win. Thanks! I haven't read any of this series yet! I've been eyeing it and it's been on my list forever, but I haven't gotten around to reading any. This would give me a good excuse to move them to the top of the list : ) Thanks for the giveaway!! I've read the first two and enjoyed them. I can't wait for The Rise of Nine. 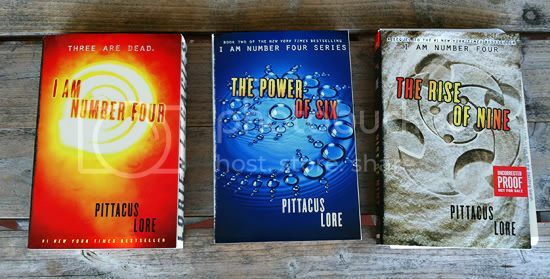 I've read the first and second book in the series - and I LOVED them. I'm so excited for The Rise of Nine, and hope I win this giveaway! Thanks for the giveaway! My brother and I have read and enjoyed the first book. I haven't read the series yet, but I've really been wanting too. I loved the movie! I've read the first and second books. My daughter really likes this series and would love to own these books. Thanks for the giveaway. Yep. I've read the first two books, and I own the second one. I also read The Lost Files: Six's Legacy. Oh yeah! I saw the movie too! I read the first 2 books! I've read the first two books already :) The third sounds amazing. I can't wait to read it! I haven't read any of the books in the series yet (I've seen the movie though). I read the first book when it first came out and loved it. I was bummed by the movie adaptation though. :( Thank you for the giveaway! Currently reading the third one. They so messed up the movie! I really hope I win this giveaway. I saw the movie, but had no idea that it was based on a book until recently. I am beyond excited to get into this series and discover a new author. Here's hoping! I had no idea that the movie was based on a book until recently. I enjoyed the movie and can't wait to get into the books and discover a new author. I'm sure I will like the books even more than the movie. Here's hoping! No, I haven't read any of the series yet. This is one of my absolute favorites series. I still need to read Rise of Nine. I haven't read this series yet but it's been on my to do list forever! My small local library has it on holds for all perpetuity, it seems like. Each one of these books give you just enough information and character development to draw you in to the next one. I love how each character is so fully developed and uniquely different from each other. I am not bored yet, and am still reading!